Pictured here in Black on ash, the T57 is the next stop in the evolution of our T Models. While the fretboard remains maple, our T57 is available in a wide variety of finish options. 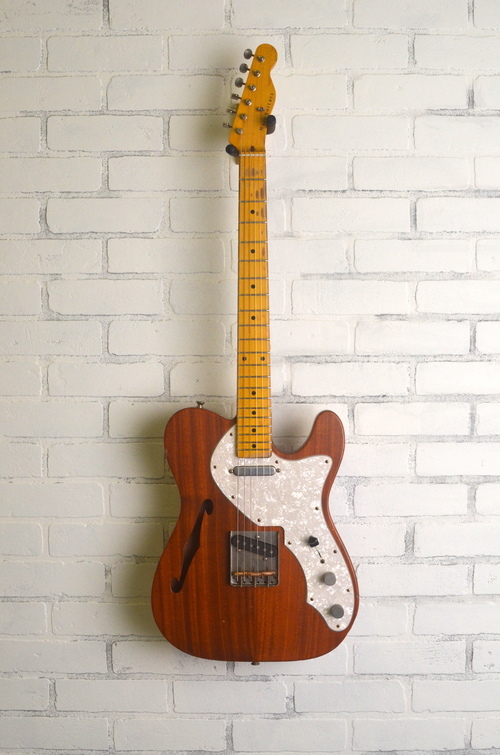 This model comes with a1-ply White pickguard on an ash body, though alder may be used on solid colors. The additional finish options and White guard give this transitional model character. The T57 is available in all of our standard colors. Our T63 represents a big shift in focus from the T52 and T57. This model is available in all standard finishes we offer, including the classic automotive inspired colors we've all come to know and love. The T63 is available with a 3-ply pickguard in Black, White, Mint, or Tortoise Shell. This model comes in either ash or alder, with a rosewood fretboard. After sourcing a yard of the original material found in Germany, we set about a lengthy process of replicating the paisley overlay accurately. You won't find a more faithful representation on a modern build. The nitrocellulose lacquer (as opposed to polyurethane) gives our T68 a marked improvement in resonance. A radical departure from the solid body T Models, the T69TL's semi-hollow body offers both weight relief and unique tonal characteristics. While most opt for the more traditional look of natural finish on mahogany (as pictured here), we also offer ash and alder bodies in any of our standard finishes. A maple or rosewood fingerboard and a distinctly shaped 3-ply pickguard in Black, White, Pearl, or Tortoise Shell complete this alluring gem. Our T72TL is an iteration of the T69TL that maintains the semi-hollow body, while introducing two wide-range humbuckers and an S Model hardtail bridge. These pickups offer more energy, bigger sound, and reduced hum as compared to the T69TL. This model is available in ash or alder in any of our standard finishes, with a maple or rosewood fingerboard and a 3-ply pickgaurd in Black, White, Pearl, or Tortoise Shell. Our TC72 is the perfect choice for those looking to capture the best of both worlds. It maintains the clean lines and feel of the T Models, but introduces a wide range humbucker in the neck. Additional volume and tone knobs allow for independent control of each pickup. The TC72 maintains a traditional tone in the bridge position, while the wide range humbucker in the neck opens the door to tones typically associated with the Les Paul. Shown here in Black on alder with a maple fretboard and a 3-ply Black pickguard. This model is available in both ash and alder, in all of our standard finishes, with either a maple or rosewood fretboard. The 3-ply pickguard is available in Black, White, Pearl, or Tortoise Shell. Straying even further from traditional designs, the T72DLX, with its two wide range humbuckers, S Model headstock, Les Paul inspired wiring, and available S Model tremolo bridge make this guitar a unique and versatile choice. The Lollar wide range humbuckers used in this model are a superior upgrade from the thin and weak wide range humbuckers of yesteryear. Improvements in output and dynamic range have finally made this cult classic a viable tool. Pictured here in mocha on alder, the T72DLX is available on either ash or alder, in any of our standard finishes, with a maple or rosewood fretboard, and a 3-ply pickguard in Black, White, Pearl, or Tortoise Shell. A subtle yet remarkable departure from our traditional T Model builds. The T2HB offers players the ability to delve into tonal territory not usually associated with this classic body style. The T2HB features two humbucking pickups, a 500K volume pot, and a cut vintage style bridge with compensated brass saddles. This guitar offers a unique tonal experience while maintaining a familiar presentation. The T2HB is available in all our standard colors, with either a 3-ply pickguard in Black, Pearl, Tortoise Shell, or White, or a 1-ply pickgaurd in Black or White. The T3HB adds a third, middle position, humbucker.